Shep manufactures two basic types of "standard" Equalisers. These were originally based upon the NEVE Designs but have been redesigned and updated. All Equalisers are fully discrete and built to a very high standard. They use LCR type equaliser circuits and have switch selectable frequency controls for repeatability. 19 inch racks are available to house these modules and are available to hold 8 modules vertically or a pair of modules screened horizontally. They are fitted with XLR connectors and have the option of internal PSU or external. The PSU has Phantom Power and switches are mounted on the Racks to switch Phantom power on an individual Channel basis. A version is available which has output level trims. WHY DO CLIENT WANT SHEP EQUALISERS? There was such a great growth in the development of Analogue mixing consoles especially with manufacturers like SSL who were exceptionally good at the design of console Automation, that manufacturers tended to go for technology at the expense of Audio Quality. After some time studios and engineers who were always striving for audio quality, became increasingly aware that the new Equalisers did not sound as good as the old discrete type and especially the old Neve Equalisers, which in their opinion sound so much better. Shep also manufactures the Nemesis studio Foldback system, which is used by Clients such as Sting, The Hit Factory, Capitol Records, Theater Wien, etc. SSL now specify this system when doing large installations. A system has just been installed at David Gilmours Studio. Modules are available in racks, complete with Mains Powered Supply. Shown above is the 2 Module rack fitted with SN8 EQ modules. There is also available 5U and 7U racks whcih hold 8 modules vertically. ie SN8 (5U) and SN12 (7U). These racks come with a separate PSU. Shep Associates are pleased to announce a Four Band Equaliser, designed in his traditional form, by Mr Rupert Neve, 'The Designer'. 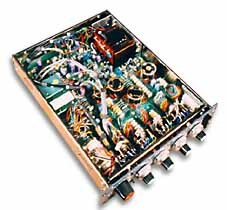 This equaliser is based upon his earlier design concepts from the 1960's and is fully discrete, Class A.
Equalisation is now achieved by the use of Inductors and Capacitors. A new Mic pre-amplifier is included together with a true Class A transformer coupled output stage. The Classic Equalisation curves are retained with Improved Sonic Quality and performance. A pre production prototype will be shown at the AES show in New York on the Shep booth 1140. 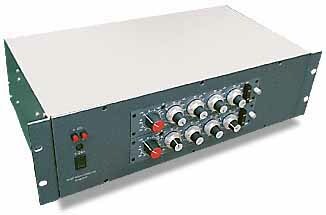 The new equaliser will be in production early 1998.